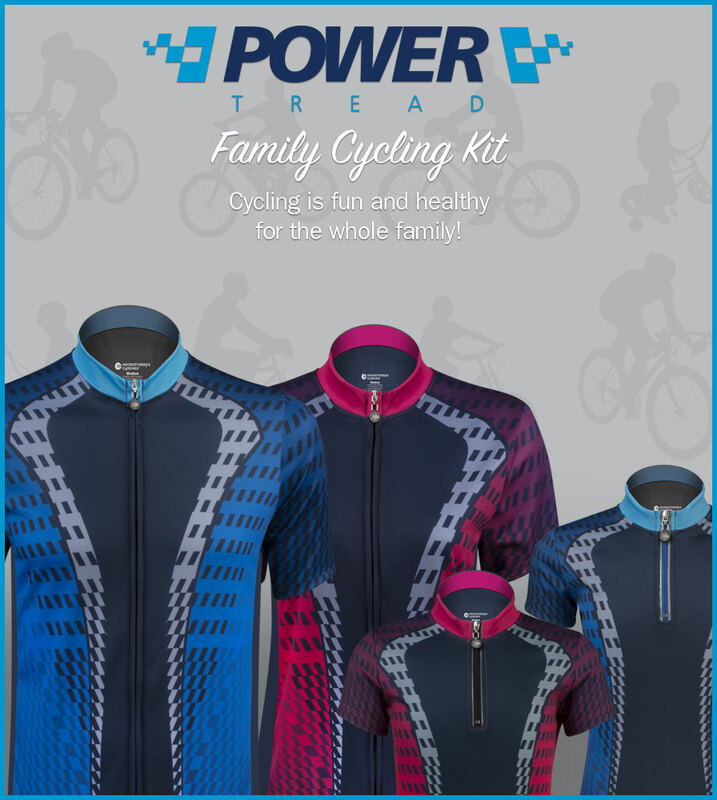 Kids can't wait to put the pedal to the pavement while wearing these Power Tread cycling jerseys! 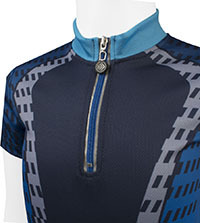 This quarter-length zip jersey is easy to put on and offers complete freedom of movement, thanks to our performance-enhanced materials. Made with Wick-Away polyester, it will keep your kids dry and cool to help them ride longer and feel stronger. The fabric also offers 4-Way stretch to move with their bodies through the cycling motion, almost like a second skin. Adult and Children's sizes - In Stock! 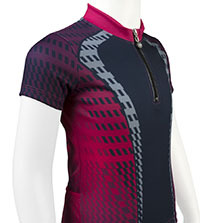 The sleek and stylish background on this elaborate cycling jersey is inspired by the bicycle tire tread. Leave your mark on people’s minds when your family power pedals past them! We wanted to create a unisex design that could be worn by men and women and children so families can wear it while cycling together. 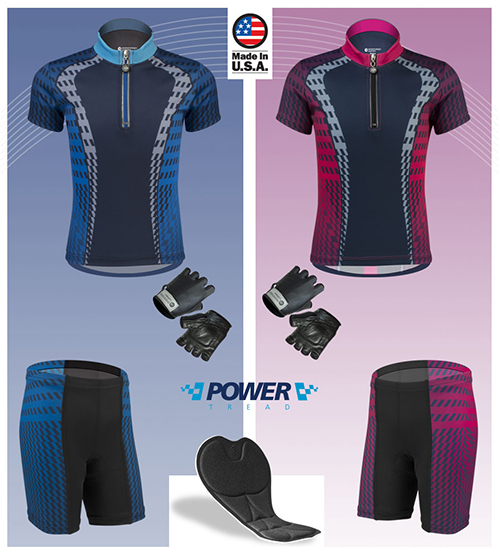 Check out the Adult's Blue Power Tread and Adult's Fuschia Power Tread jerseys! The children's cycling jersey is designed with a snug bottom hem that won’t flap while you bike. On the back of the jersey are three spacious pockets that are easy to reach and will stretch to fit a water bottle, while keeping your kid's gels, bars, and other items secure. A 3M reflective strip adds biker visibility and safety for low-light rides. The fabric is designed with channeled and crimped yarns that are engineered to transport your body's perspiration to the outer layers of the fabric through a capilary action. The shape of the yarns simulate the softness of a cotton fabric yet maintains the highly effective moisture transport that matters to active athletes. It is proven that you are more comfortable when your skin is dry. This fabric is excellent at wicking the moisture away from your skin to support your effort to stay as dry as possible when it is hot and sweaty! CHOOSE BETWEEN TWO COLOR OPTIONS: PINK OR BLUE! MAKE IT A KIT FOR THE WHOLE FAMILY! Pleasantly surprised how nice this Jersey fit and quality. Great service with international delivery (direct and not available on Amazon) in a matter of 3 days. The only solution for a budding 5 year old cyclist that I have found with the two key colours on offer. Sharp looking with nice fit, once you find the right size (seems to run a little smaller than the measurement chart). Holds up well to wearer abuse. Kids wanted to wear all day! Love this family line of jerseys - we all match! Aero Tech Youth Jersey - Lil Rockets - Orange/Pink - Cycling Jersey Blast Off On Your Bike!